All connective tissue contains relatively few cells with large spaces between them. 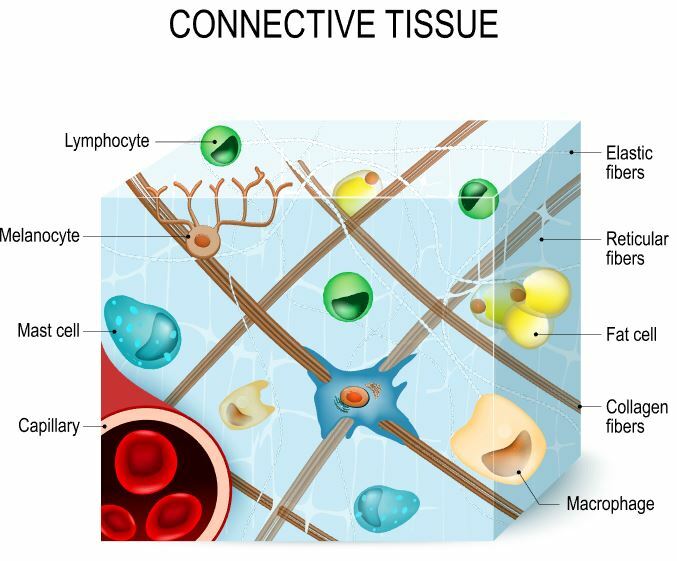 Connective tissues are composed of not only of specific cell types, but also the protein fibers and ground substance that make up the surrounding extracellular matrix. 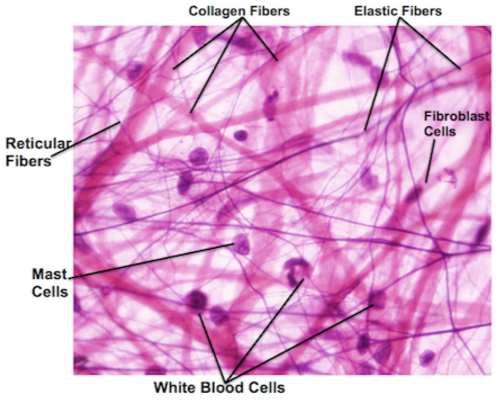 Connective tissue cells are interspersed within the unique extracellular matrix of the tissue. The composition and density of proteins and molecules that make up the matrix varies with the different types of connective tissues. It is the specific composition of the cells, ground substance and the protein fibers that make up the connective tissue that gives it the ability to provide its specific function within the body. This is the complementarity between structure and function in connective tissues. The connective tissues (connective tissue proper, bone, cartilage and blood) have the same embryonic origin. They all originate from mesenchymal stem cells, except for the blood. Blood originates from hematopoietic stem cells of the red bone marrow within bone tissue. What are the "Protein Fibers"? The matrix has a scaffolding made up of fibrous proteins. that provide support for the connective tissue. 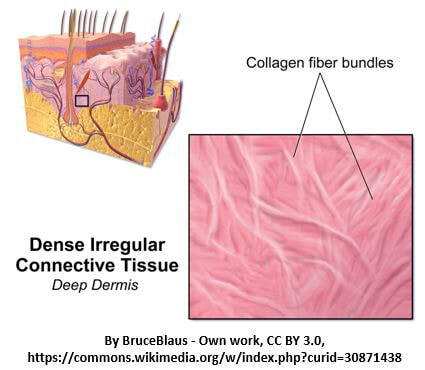 ​ There are 3 types of protein fibers that can be found in connective tissues: 1) collagen fibers, 2) reticular fibers, and 3) elastic fibers. The types, density, and distribution of the protein fibers is unique in different connective tissue types. The dermis is the larger, more durable portion of our skin which lies deep to the epithelium. It is primarily composed of connective tissue proper. 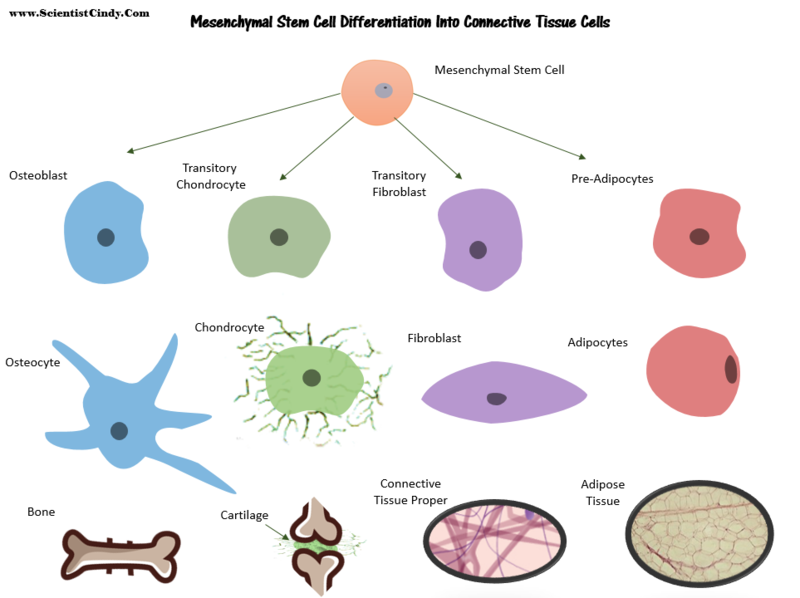 Areolar Connective Tissue - A Type of Loose Connective Tissue from the Category "Connective Tissue Proper"
Fibroblasts are the primary cell type of connective tissue proper. 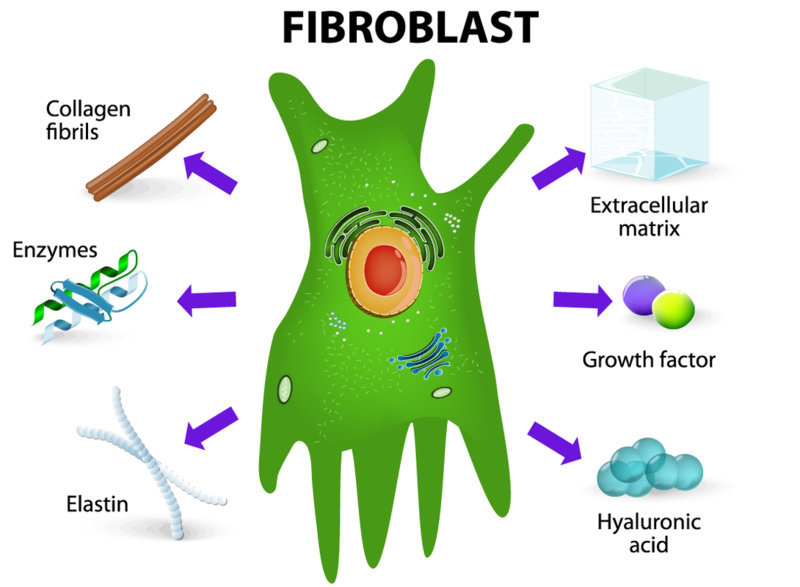 Fibroblasts continuously secrete components that make up the ground substance (semi-liquid substance) of the extracellular matrix. The thin, superficial layer of the dermis is called the papillary layer. 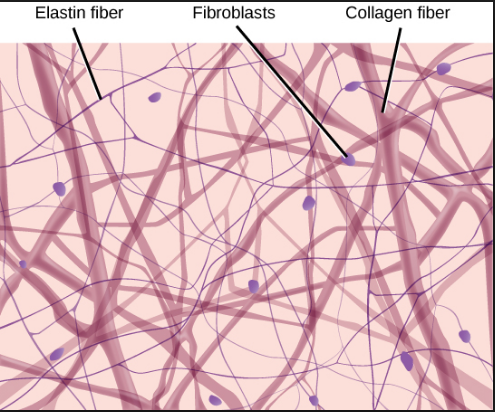 The papillary layer is composed of areolar connective tissue which has 1) collagen fibers, 2) reticular fibers and 3) elastic fibers. Elastic fibers provide the stretch-recoil properties of skin, and collagen hydrates the skin by holding onto water molecules. ​ The papillary layer composed of areolar connective tissue. ​This is a loose type of connective tissue proper. The reticular layer is composed of dense irregular connective tissue. This is a dense type of connective tissue proper. 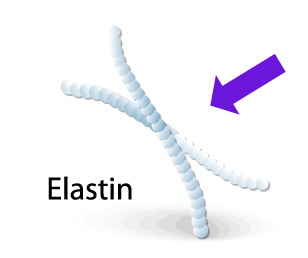 Elastic fibers provide the stretch-recoil properties of skin. It is important that the papillary layer is composed of LOOSE connective tissue, so that the phagocytes and other defensive cells (mast cells and white blood cells) can travel around and "patrol" the area looking for any foreign invaders that may have penetrated the protective barrier of the epidermis. 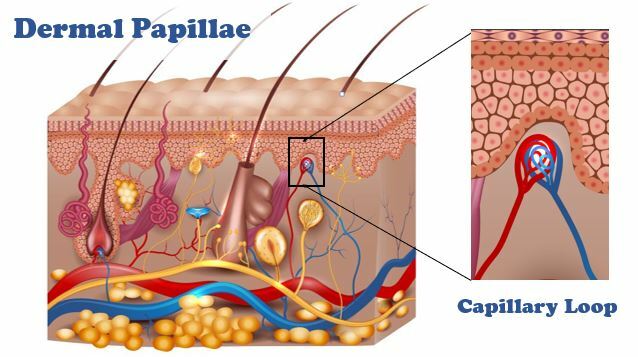 The papillae and the papillary layer as a whole, contain many specialized features and structures that enable the dermis to have various functions. Krause End Bulbs (otherwise known as bulboid corpuscles) are thermoreceptors which give us our sense of temperature. Meissner’s corpuscles (tactile corpuscles) sense light touch. They are found in the papillae of the papillary layer of the dermis only. 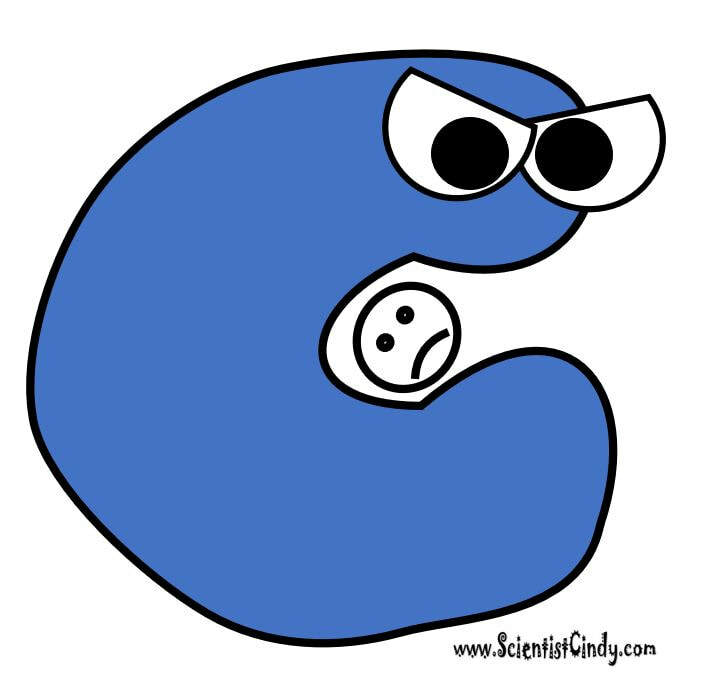 Pacinian corpuscles (a.k.a. lamellar corpuscles) sense vibration and pressure. They lie in the deep portions of the reticular layer of the dermis. 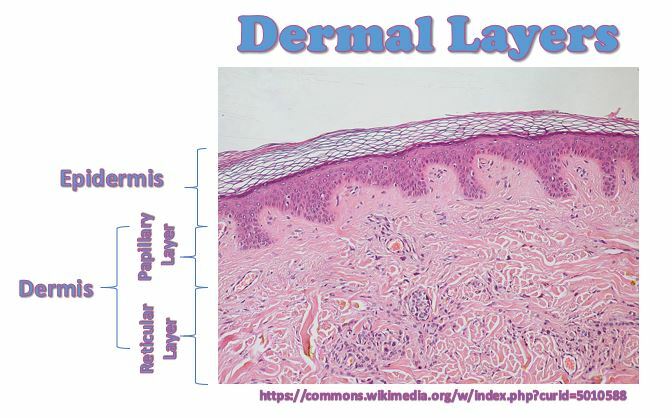 The reticular layer of the dermis lies beneath (or deep to) the papillary layer of the dermis and above (or superficial to) the hypodermis. The reticular layer is much larger than the papillary layer and is composed of dense irregular connective tissue. 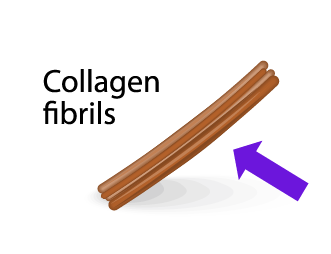 inter-locking collagen fibers​ - collagen keeps skin hydrated by holding water. Tension (or cleavage) lines. 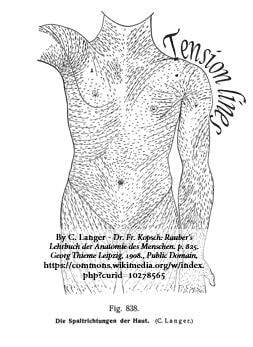 Tension lines of the human skin. They follow the main fibers of the connective tissue of skin. Surgeons use these lines as guides. Incisions are made parallel to these lines, which assists in the healing process. ​ Melanin works along with levels of carotene and hemoglobin in the skin to determine the coloration of the skin. ​Flexure lines are created around joints due to the dermis being anchored to deeper structures and being resistant to sliding motions. Melanin is produced in the skin and comes in various colors and types. Exposure to UV radiation stimulates melanogenesis which causes the skin to darken. Melanin filters out UV radiation and protects the skin from UVB radiation damage which can lead to sun burns, premature aging and melanoma (skin cancer). YELLOW SKIN (Jaundice) - Jaundice is a severe condition in which medical attention should be sought immediately. The white portion of the eyes (sclera) becomes yellow along with a yellowing of the skin. This condition is usually a sign of a failing liver and the yellowing of the tissues is due to the build up of the excess yellow bile stored in the tissues. Addisons disease - Addisons disease is marked by an underactive adrenal cortex and therefore, a reduction in the release of steroid hormones. Pituitary gland - a pituitary tumor could be releasing too much melanocyte stimulating hormone (MSH).